Out of Our Minds Banners offers nearly 60 unique Christian silk banner designs. See our Design Gallery. As well as our banners which you can buy as small, medium and large, most designs are available for purchase as ribbons, garments, scarves and wraps. A recent addition are our mini-banners. See the product formats. 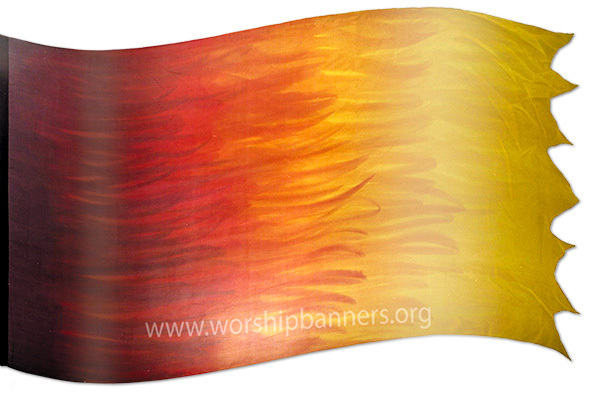 To purchase a worship banner, first browse our Silk Design Gallery to select your chosen design. Click on one of the to view the design details and to add product to your basket. Once you've completed your shopping, click on the "Complete checkout" button in the 'shopping basket' to provide your contact and delivery details. You can pay for your banners via secure online credit card payment. Other payment options are available. Contact us if you'd prefer to order via another means. At Out Of Our Minds Banners we pride ourselves in the quality of our products. Each one of our silk banners or wearable banners is individually hand-painted. When you purchase an item from us you will receive a beautiful and unique work of silk art based on the designs featured here.